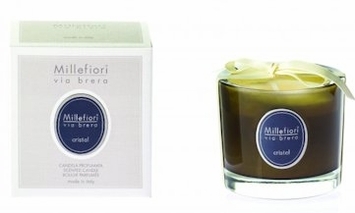 Via Brera Millefiori Milano Scented Jar Candles are a brand new scented candle line that complements the Millefiori Milano Reed Diffuser Via Brera products, characterized by traditional, refined and romantic fragrances. Each Via Brera candle comes in a heavy glass vessel and is gift boxed and ribbon wrapped. Dimensions are 3" tall x 3.5" in diameter. Candle holds 6.3 oz of highly fragranced wax.